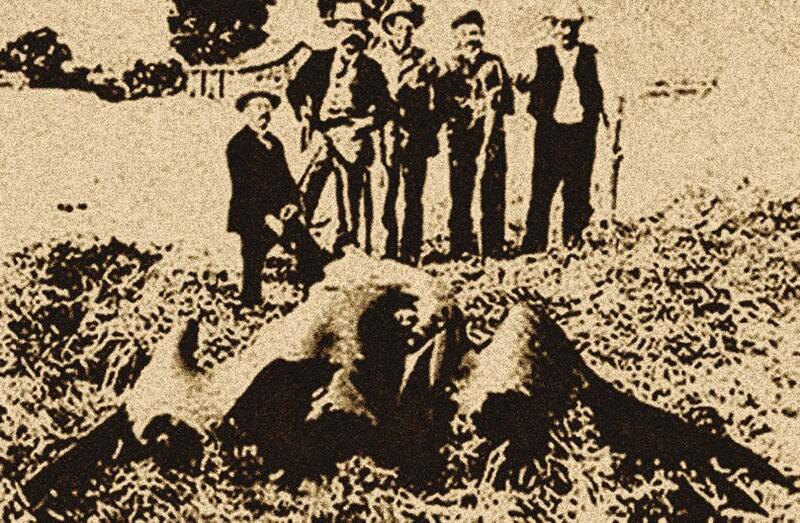 Tombstone’s Flying Monster The Old West cold case on the Thunderbird photo is solved in our eyes. 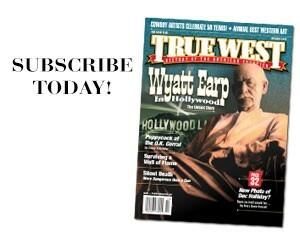 The Old West cold case on the Thunderbird photo is solved in our eyes. One of the West’s most fascinating cold cases involves a flying monster, a dying town and a disappearing photograph. True West doesn’t pretend to have all the answers, but we have some, and they give a pretty clear picture of what happened to the picture that has been the source of such angst and wonderment all these years. 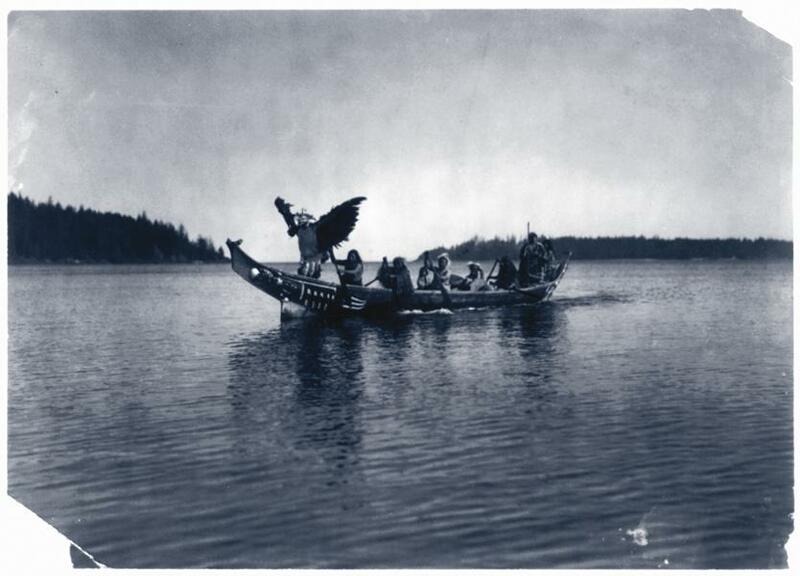 Let’s just say that it is a mystery to us that the Thunderbird photograph is still a mystery. Wow, what a story. What an adventure. And what a possible boon to struggling Tombstone, the once thriving mining community that had become famous—or infamous—for the 1881 Gunfight Behind the O.K. Corral. Tombstone had fallen on bad days by 1890 and was a town in trouble. An earthquake had shifted the earth’s plates and flooded the silver mines that had once brought so much wealth. Several attempts to pump out the water and revive the mining interests all failed. While there were still several bars in town, the population was declining and business was way off. Everyone feared the town’s heyday was past and would never come back. But Tombstone still had two daily newspapers, as did nearby Tucson. It doesn’t take much imagination to realize a flying monster would be big news, both to curious tourists and studious scientists. And any Chamber of Commerce guy worth his salt would have instantly seen the economic possibility in such a creature—this was better than a circus coming to town. It would attract visitors, certainly from Tucson and Bisbee, and folks might even come from Prescott or Phoenix to get a gander. You can make a lot of money on tourists—they need a place to stay and three squares a day, and they usually like to take home a trinket or two. So what if your tourist attraction is a freak show, money is money. But alas, that’s not what happened. There was no Chamber of Commerce effort to exploit this amazing creature; there were no scientists rushing to the town in stagecoaches to examine this prehistoric-sounding pterodactyl. There wasn’t even a mention in the competing Tombstone daily, The Nugget. And it’s important to know this: There was no photograph printed in The Tombstone Epitaph of this flying giant. From reading the one and only article ever printed in Tombstone about this incident, it is clear that no picture had yet been taken—if one ever was; if there ever was a giant bird to photograph. All of this would end there except for the marvels of Western lore. 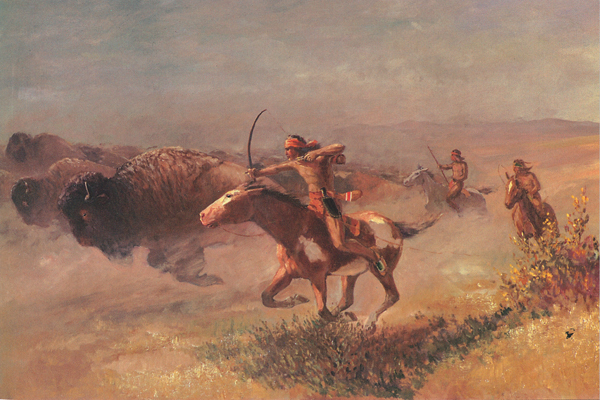 Horace Bell first reminded everybody of the story in his 1930 book On the Old West Coast. With his reprint of the Epitaph story (slightly different from the original), Bell never mentioned a photograph. Nor did he claim one existed. Another writer, H.M. Cranmer, contended in Fate magazine in the fall of 1963 that the picture had been published in newspapers all over the country. Ivan T. Sanderson, considered an eminent researcher in the study of strange phenomena, claimed to not only seeing the photo, but once having a photocopy he unfortunately loaned out and never got back. 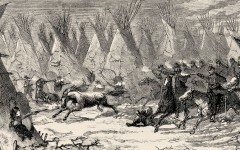 Someone later came forward and remembered seeing Sanderson display the photo on Canadian television, although no copies of the show have been found. In the late 1990s, the search for the Thunderbird photo had become an obsession. Mark Chorvinsky’s Strange magazine invited a discussion on the topic for several issues and found readers who believed they had seen the photo in everything from men’s magazines to Time-Life books. Let’s go back to how this “Thunderbird Photograph” story got started. It was 1963 and Jack Pearl’s article in what some call the “sensationalistic men’s magazine” Saga. He claimed the Epitaph printed the photo in 1886. He was wrong on all counts. The Tombstone Epitaph staff members went back in the late 1960s, searching for the photo so it could solve this Old West mystery. They couldn’t find one. One wasn’t printed with the original article, and the paper didn’t publish a follow-up article. Plus Pearl is wrong on the year—the incident didn’t even happen until 1890. Others searched newspapers around the country—remember, Cranmer claimed the photo had been published nationwide—and no photo was found. Amateur sleuths who were certain they’d seen the photo in a certain book went back and found the book did not contain such a picture. Just last year, Cryptomundo.com published two photos and a drawing, and asked “Lost Thunderbird photo found?” None of them shows a bird pinned to the wall of a barn. One shows five men standing behind a giant bird on the ground; another shows eight Civil War soldiers around a bird at their feet; and the third is a drawing showing eight men holding a big bird upside down. Mark Hall believes the description of the photo is so vivid that it has created a “shared memory” of something that does not exist, he wrote in his book, Thunderbirds: America’s Living Legends of Giant Birds. Think about it a second. 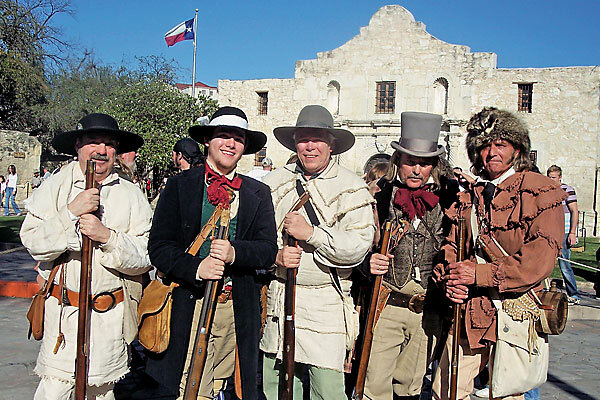 Can’t you just see the guys, all in cowboy hats and boots, some with guns on their hips, some with mustaches, most looking grungy, standing next to an unpainted—or badly peeling—barn with a big bird nailed to the side. It’s not hard to see. The bottom line seems clear: The evidence is overwhelming that this “photograph” just never existed. It’s from Indian folklore we get the idea of giant bird-like creatures called Thunderbirds. Some believe they truly exist; others are convinced they are mythical, like the Unicorn. Bell wasn’t the first, nor would he be the last, to report on thunderbirds as real creatures. 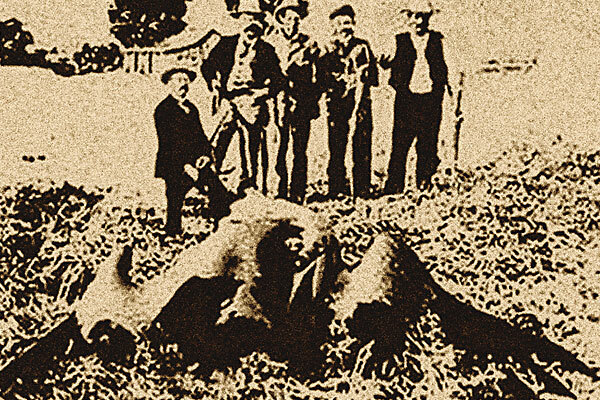 So maybe there really was a giant bird in Arizona Territory at the end of the 19th century, and maybe two ranchers really did track it down and shoot it, and maybe they did come into town and get some “prominent” men to go with them to bring it back. But whatever happened next was so unspectacular, so uninteresting and so unremarkable that nobody spoke of it again. Would that have been the response if there really had been a dead dinosaur-like bird outside of town? Hardly. So you’re left thinking the story of the Tombstone Thunderbird was the fantasy of a bored reporter on a spring day when nothing else was going on in that down-and-out town. You know he’s right about that. The numbers shown in the original photo correspond to the order these men appear in the fake photo above. Those planted in the photo, who were actually posse members who caught Sontag, are #2 (Tulare County Deputy Sheriff George Witty) and #4 (the body of Tom Burns, a Los Angeles detective from the Harry Morse Agency, shown with the head of the man at the far right). The Thunderbird photograph that is most circulated is shown on the next slide. 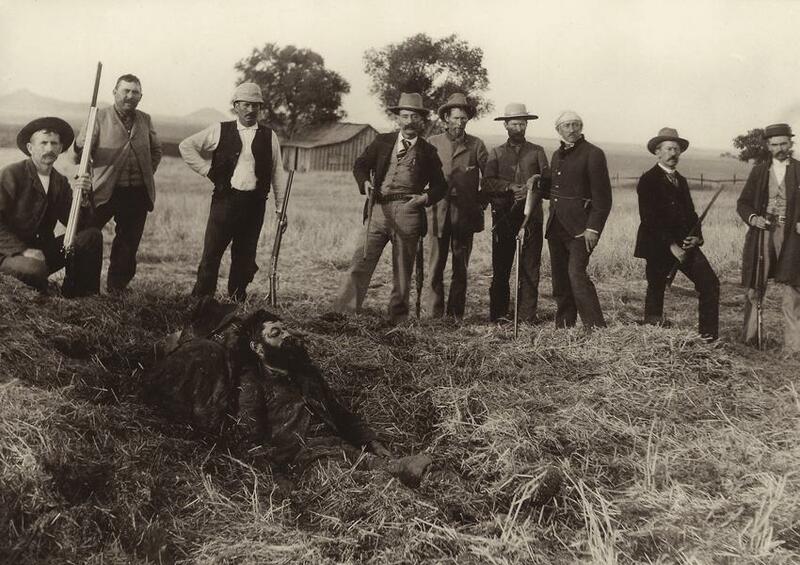 Yet the bulky bird the men are looking at was actually added to this existing photo of 19th-century train robber John Sontag (laying wounded in the straw at the Stone Corral in Tulare County, California) with some of the posse members who caught him, as well as reporters and local ranchers.